Anita Erskine is a woman who changes the atmosphere in a room with her bubbly personality. She has over the years organized programs to empower women across Africa. She is a voice to reckon with in the media. Born in Jerusalem to Lieutenant General Emmanuel Erskine and Rose Erskine, the actress, TV show host and Feminist has succeeded in creating a beautiful brand for herself. She is one of the strongest women in the media who uses her strength to encourage young girls and women across Ghana. The beautiful entrepreneur took to her Instagram page to post an inspiring quote to empower all everyone. The post comes with a powerful boss-like picture. 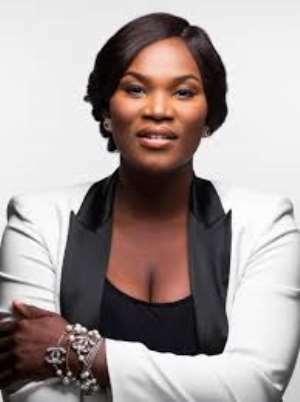 Anita Erskine-Amaizo is a Ghanaian entrepreneur, TV and radio presenter. She is married to a very supportive husband with whom she has two kids. She has hosted The One Show; a Talk show on Viasat 1. She is also host to +233 Discovery; TV show featuring celebrities and inspirational stories.